Know immediately who dialed the emergency number, create panic buttons, and create speed alarms that play through your paging system and phone speakers. You have complete control over emergency notifications with 3CX Emergency Notifier. 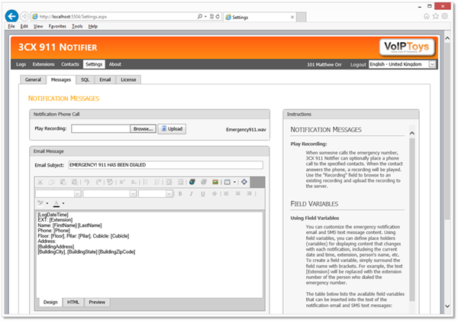 You control the content of notifications, who is notified, and how they are notified (email, SMS text, and phone call). Show emergency responders exactly where the problem is located. You can even program your phone with panic buttons and continuous alarms too! We understand the extreme importance of safety in schools and the workplace, this is why we created Emergency Notifier. We strongly urge you to take a hard look at this tool and think of how you should apply it to your organization. This is a "MUST HAVE" feature for educational facilities, businesses with multiple buildings, or anyone who wants a better way to manage emergencies. Program panic buttons on your VoIP phone. Notify emergency responders with a single button press. Initiate fire alarm by pressing a button on your phone. Turn it off by pressing the same button a 2nd time. When the emergency number is dialed, Automatically send emails, texts, and/or direct phone calls to your designated emergency responders and staff with the exact location of the emergency. know exactly where the emergency exist by building, floor, pillar, and cubicle number. Export extension locations to carrier to ensure emergency responders go to the right location. Whether someone has pressed a panic button, alarm, or dialed an emergency number, you have instant notifications. With instant notifications comes faster response times. This is essential when dealing with critical emergencies. Protect yourself by recording notes about the event, what happened, who responded, and actions taken while the event is fresh. Watch the web demo! View the recorded webinar below for more information! 3CX Emergency Notifier is a web based application, so there is no need to install applications on staff computers. If your VoIP phone has programmable buttons, you can now program buttons to instantly initiate audible alarms that play through your overhead paging system, and through the speakers on your phones. Need to send emergency notifications to roaming employees? We can simultaneously send emails, texts, and direct phone calls to your designated emergency responders. For continuous alarms (Fire alarm for example), pressing the button on your phone initiates the alarm, and pressing the same button a second time turns off the alarm. Need a silent alarm? We can do that too! You choose whether an alarm plays an audible alarm, or silently sends emergency notifications. Don’t have programmable buttons on your phone? No problem, you can still dial the extension associated with the desired alarm. Know immediately who dialed 911 with 3CX 911 Notifier. Whether you are a small school, or a large campus of buildings, you need to know immediately who dialed 911. With 3CX 911 Notifier, your emergency responders will know exactly where to go. Know exactly where the emergency exists and who made the phone call to 911. Easily manage contacts and extension location information. Security through your 3CX extension and PIN. 3CX 911 Notifier also provides logs of all events. You can easily review events, who was notified, and how, and update notes on an event so you have a record of what happened and who responded. Note: Windows 10 has a much better Text-To-Speech engine compared to Windows 7 and 8. Can I send notifications through a paging system? Sure! If you can call the extension or phone number from 3CX, you can send phone notifications through it. Is 3CX Emergency Notifier available for 3CX V15.5? Yes! 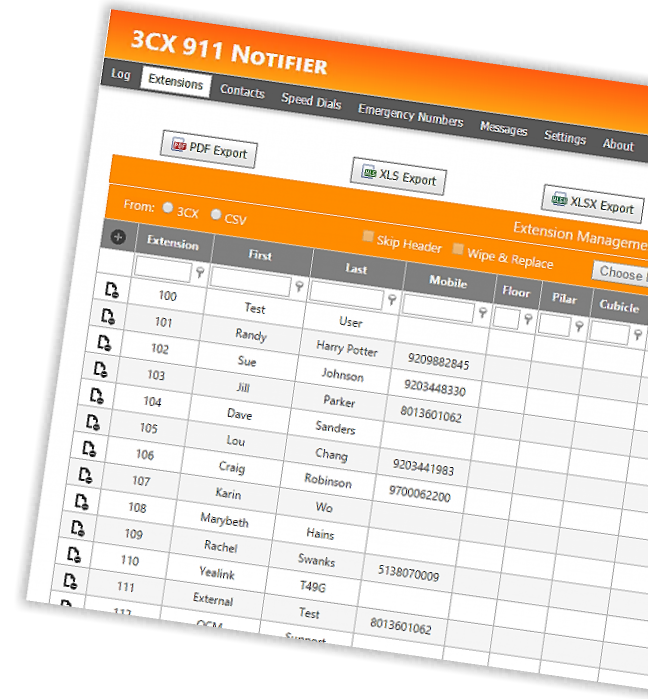 3CX Emergency Notifier now fully supports 3CX 15.5 (Windows) and the new Call Flow Designer. Coming soon to the Cloud and Linux too!